Many triathletes with families spend a lot of their time trying to figure out how they are going to fit their workouts into their busy lives as they do actually executing their workouts. Keeping the harmony at home isn’t easy, but you aren’t the first to go through this situation and you certainly won’t be the last. My goal of this article is to give you a few ideas about getting your life a little more in balance. Part of coaching is helping your athletes manage their time. Being overwhelmed with work, family and training commitments may sometimes lead to an inability to take a step back and organize your life. When you are in hurry all the time, clarity is the first thing that goes. As a coach, one of the most important points that I stress to my athletes is to ‘Get it done early when you aren’t being missed by your family’. In other words, train when they are sleeping. To do this, two days during the week you ride a high quality session on the bike trainer at 5:30 for 1 hour and then jump on the treadmill or out the door at 6:30 for a 30 minute run. On the opposite days of the week get in the pool by 5:30, into the weight room by 6:15, home by 7:15 to help out, or head straight to the office. Your mind and body are freshest as soon as you wake, allowing you to have good quality workouts. If you have trouble getting up early, then get to bed earlier. We all know the importance of sleep and the earlier you get to bed, the better you’ll sleep and the more you’ll sleep. This early bird training lets you get in six hours of training in four days, plus you aren’t using up your lunch hour or after work time that can be spent at home helping out your spouse or going over homework with your kids. Just make sure that at least once a week you let your other half sleep in. Another option is to include your family in the workout. It takes some creativity but it can be done. Here are four ways to include your children in your training. Not only will you get in your workout, but you will set an example for them to follow. If your children are small push them in a stroller. You won’t run your normal pace, but you’ll get a heck of a strength workout. Ironman World Champion Craig Alexander would push his kids around town here in Boulder and he’d be running 10 minute miles, straight to the playground, and then back to pushing the stroller. Another idea is if you have two kids and one is old enough and can ride a bike, then push one in the stroller while the other one rides their bike. This was my key to getting workouts one time when my wife was away overseas for two weeks. It wasn’t pretty, but I got my runs done even if it wasn’t my fastest. 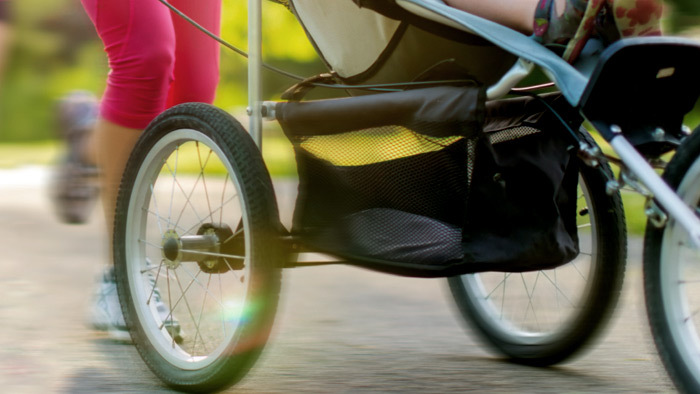 Use a bike trailer to pull your kids around town or even to do hill repeats with them in tow. One key workout that I used to do was to put the kids in the bike trailer, and hammer from playground to playground. I could make two to three hours go by pretty quickly while stopping at multiple playgrounds. You can make this a big gear ride while standing up and pedaling hard for 10×2 minutes in your 53×12. For long rides, you can ride to a specific spot – whether it’s 50, 75 or 100 miles away. Your family gives you the appropriate head start and you get your ride in, the family meets you at set meeting point. Then you can all have a picnic or lunch together. If you can work it out, you could even run a few minutes off the bike. Planning ahead and including everyone will go a long way to quelling any resentment that “all you care about is your training” argument that’s sure to pop up as you get deep into the training cycle. Include your kids in your long runs, letting them bike beside you, carry your water and chat with you. It’s great bonding time and your kids will benefit as they see you keeping fit, striving for goals and it will give them inspiration. For those quality run workouts, bring your kids to the track and let them kick around a soccer ball while run your intervals. The options are truly endless, but you have to be willing to be creative. Monday – day off from training plus spouse sleeps in! Tues-Fri*: 1.5 hours early each day (6 hours total). Sat – up early for 3 hour ride and run off bike, done by 930am. Sun – up early for 2 hour run or run with children later in the day. *Using a lunch hour to get in some core and/or strength work or an extra swim, is even better. The best advice that I can give you is to get everyone in your family on board as you try to balance all the responsibilities in your life. Including your family in your goals and allowing them to take part in helping you achieve them will go a long way toward keeping your family and training as balanced as possible. There is no perfect situation and very rarely does it go well all the time, but making the effort to keep everyone happy will usually lead to less conflicts with your family. When you get to cross that finish line at your A race of the year, and your family is there to greet you, it will all be worth it!